Trainer Bob Baffert is loaded for bear, which means aggressively seeking confrontation, when it comes to next month’s Breeders’ Cup. He is the third leading winner of BC races with seven triumphs. He won his first in 1992 in the Sprint with Thirty Slews and his last in the same race three years ago when Midnight Lute repeated. Baffert could have even more BC starters than in ’99 when eight ran at Gulfstream Park. He hopes to do better than the afternoon I witnessed trackside when he had just two seconds – Chilukki in the Juvenile Fillies and Tuzla in the Mile. The conditioner hopes to send nine horses to Louisville. “I’d better get nine spots on the plane,” he recently told the Daily Racing Form. Right now he plans to saddle Euroears and The Factor in the Sprint and Candrea in the Juvenile Fillies. Baffert captured the Juvenile Fillies twice with Indian Blessing in ’07 and Silverbulletday in ’98. He’s also counting on Game On Dude for the Classic, which has escaped him. His best finish came in ’98 when Kentucky Derby-Preakness champ Silver Charm was runner-up to Awesome Again. Baffert is having a great year with his horses capturing more than two dozen graded stakes races. Game On Dude leads the stable with victories in the $750,000 Santa Anita Handicap and the $250,000 Goodwood Stakes, both Grade 1s. In the Goodwood at Santa Anita on Oct. 1, he dueled with Awesome Gem before scoring by a half-length at the end of 1 1/8 miles. Both were sired by Awesome Again. Baffert called the winning effort “incredible,” adding that “I feel good about him” going into the Classic. However, Game On Dude will face a fairly strong field in the Classic that will include Flat Out, who posted victories in the Jockey Club Gold Cup and Suburban at Belmont Park, and was Woodward runner-up to filly Havre de Grace, one of the future betting favorites in the Nov. 5 race. Bafffert’s other BC hopefuls are Irish Gypsy, Filly and Mare Sprint; Irrefutable, Dirt Mile; Secret Circle, the Juvenile or Juvenile Sprint; Drill, Juvenile; and Plum Pretty, Ladies’ Classic. One Baffert trainee that won’t make the BC is Coil, winner of the Haskell Invitational that finished third in the Goodwood. He announced Sunday he will rest the 3-year-old and run him in stakes next year at Santa Anita’s winter-spring meeting. 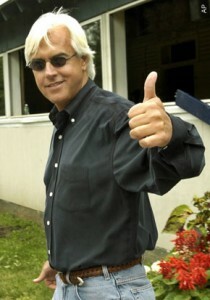 Baffert is approaching the Breeders’ Cup during a very successful season. Through Oct. 9, according to the Racing Form, his stable had won 106 races and earned more than $11 million, third on the national list behind trainers Todd Pletcher and Steve Asmussen. He is fourth in BC earnings with $10,720,000 and a record of 7-9-3 in 57 outings. The Hall of Fame trainer has won two legs of the Triple Crown four times, with the Belmont Stakes his nemesis three times. Baffert took the Preakness five times — his latest in ’10 with Lookin at Lucky, tying him for second with two others, including Lukas. He strung together three Eclipse outstanding trainer awards beginning in ’97. And he was responsible for 11 horses being crowned Eclipse champions in 14 categories.